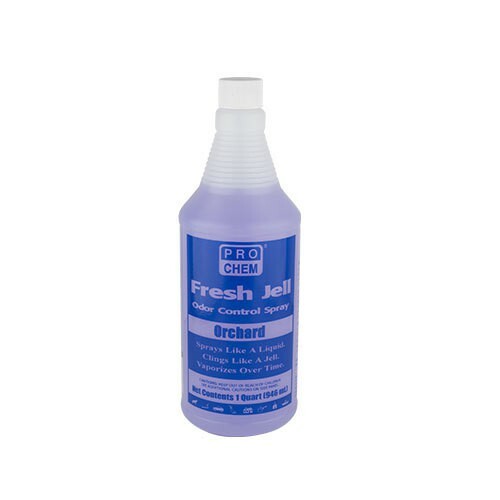 Fresh Jell | Pro Chem, Inc.
FRESH JELL is a breakthrough air freshener that lasts longer than other space sprays. It is a gelatinous fluid in the bottle, but after a little shaking, it liquefies and can be sprayed through a trig sprayer. After it hits the surface, it jells again and clings to the surface as it slowly evaporates. Spray a fine mist on hard/porous surfaces such as ceiling tile, carpets, walls, brick, or concrete block. Ideal when sprayed above ceiling fans or on air conditioning filters. Reapply after product vaporizes and more odor control is desired.